The hoatzin, Opisthocomus hoazin, is a peculiar bird whose position within Aves is often discussed but with little resolution. In recent history, it has been postulated that it is most closely related to pigeons and doves (Sorenson et al., 2003), turacos (Hughes and Baker, 1999; Hughes, 2000), cuckoos (Sibley and Ahlquist, 1973; Hedges et al., 1995), and galliforms (Wetmore, 1960) amongst others. Recent morphological analysis nests the hoatzin within the clade including Cariamidae, Cuculidae, and Musophagidae (Mayr and Clarke, 2003). The geographic range of the hoatzin extends from northern to central South America along the Amazon and Orinoco river basins (Sibley and Ahlquist, 1973). These birds live in rainforests and are found primarily near these freshwater sources. Their crop is specialized for breaking down leaves, which make up the majority of the birds' diet. Like herbivorous mammals that have large foreguts used to ferment grass and/or leaves, a large space also is needed by O. hoazin for digestion of the large amounts of plant material that they take in. The crop, a feature unique to avians, is enlarged in the hoatzin and used to both mechanically and chemically break down plant material (Grajal, 1995). The space taken up by the enlarged crop is accommodated for by a decrease in the size of the sternum. As a result, less room is available for the attachment of flight muscles; thus, hoatzins are poor fliers (Grajal, 1995; Beebe, 1907). One of the most distinctive characteristics of the hoatzin is the claw on the wing of the juvenile. It uses this claw climb up and along trees. To escape a threat, the young hoatzin may drop into the water and swim to vegetation where it can hide. This specimen, a hatchling, was collected in Guyana on 20 October 1922. It was made available to The University of Texas High-Resolution X-ray CT Facility for scanning courtesy of the University of California, Berkeley, Museum of Vertebrate Zoology. Funding for scanning was provided by an National Science Foundation Digital Libraries Initiative grant to Dr. Timothy Rowe of The University of Texas at Austin. This specimen was scanned by Matthew Colbert on 14 December 2004 along the coronal axis for a total of 600 slices. Each slice is 0.1619 mm thick, with an interslice spacing of 0.1619 mm and a field of reconstruction of 77 mm. Baumel, J. J., A. S. King, J. E. Breazile, H. E. Evans, and J. C. Vanden Berge (eds.). 1993. Handbook of Avian Anatomy: Nomina Anatomica Avium, Second Edition. Publication of the Nuttall Ornithological Club, number 23. Nuttall Ornithological Club, Cambridge, Massachusetts, 779 pp. Beebe, C. W. 1907. A contribution to the ecology of the adult hoatzin. Zoologica: New York Zoological Society 1:45-65. Garrod, A. H. 1879. Notes on points in the anatomy of the hoatzin. Proceedings of the Zoological Society of London 1879:109-114. Grajal, A. 1995. Structure and function of the digestive tract of the hoatzin (Opisthocomus hoazin): folivorous bird with foregut fermentation. Auk 112:20-28. Hedges, S. B., M. D. Simmons, M. A. M. van Dijk, G.-J. Caspers, W. W. de Jong, and C. G. Sibley. 1995. Phylogenetic relationships of the hoatzin, an enigmatic South American bird. Proceedings of the National Academy of Sciences, USA 92:11662-11665. Hughes, J. M. 2000. 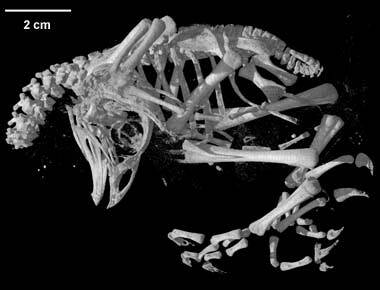 Monophyly and phylogeny of cuckoos (Aves, Cuculidae) inferred from osteological characters. Zoological Journal of the Linnean Society 130:263-307. Hughes, J. M., and A. J. Baker. 1999. Phylogenetic relationships of the enigmatic hoatzin (Opisthocomus hoazin) resolved using mitochondrial and nuclear gene sequences. Molecular Biology and Evolution 16:1300-1307. Mayr, G., and J. Clarke. 2003. The deep divergences of neornithine birds: a phylogenetic analysis of morphological characters. Cladistics 19:527-553. Shufeldt, R. W. 1918. Notes on the osteology of the young of the hoatzin (Opisthocomus cristatus) and other points on its morphology. Journal of Morphology 31:599-615. Sibley, C. G., and J. E. Ahlquist. 1973. The relationships of the hoatzin. Auk 90:1-13. Wetmore, A. 1960. A classification of the birds of the world. Smithsonian Miscellaneous Collections 139:1-37. Information on the hoatzin on Animal Diversity Web (University of Michigan Museum of Zoology). Images of Opisthocomus on ArthurGrosset.com. To cite this page: Dr. Amy Balanoff, 2005, "Opisthocomus hoazin" (On-line), Digital Morphology. Accessed April 19, 2019 at http://digimorph.org/specimens/Opisthocomus_hoazin/whole/.